Immunogen: Synthetic peptide corresponding to a portion of human PDK1 (Pyruvate dehydrogenase kinase-1). 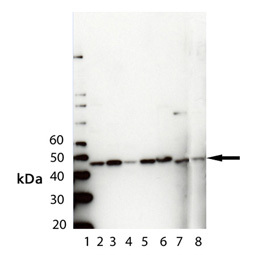 Scientific Background: PDK-1 (Pyruvate dehydrogenase kinase-1) is a 48 kDa protein kinase. It is a member of the mitrochondrial matrix protein kinase family and is related to the histidine protein kinases found in prokaryotes. PDK-1 is responsible for phosphorylation and concomitant inactivation of pyruvate dehydrogenase. Immunohistochemistry analysis of human spleen tissue stained with PDK1, pAb at 10µg/ml.